The concept of the freedom to prosper, live for their own sake and freely worship God without the Anglican church telling people to seek God their way or the highway. Too many of the Founders and settlers alike, the freedom to seek true liberty through Jesus Christ was as important, in fact more important than the other unalienable rights enumerated in the Bill of Rights. They understood that both true Liberty and freedom are derived from liberty in Christ and inspiration from the word of God. It is what gave them the principles and moral fortitude to introduce a Constitutionally limited republic. The one mistake in Judgement they made was to believe that Americans would always seek to understand and protect our unique and wonderful nation. The Declaration of Independence was written as a proclamation to the world of their reasons for separating from England. Though the founders did not know it at the time, what they sought through Providential guidance started here in America was to be a shining example for other nations to adoptto liberate themselves from the shackles of tyranny, lack and false religions. The Founders were discouraged to learn about British government plans to obliterate their Christian faith which included a belief in a direct one on one relationship with their creator. They were prepared to defend ‘the laws of nature and of nature’s God” words that define the principle upon which the Founders stood. While church leaders were well schooled in the fact that the Bible place emphasis on due submission to civil authorities (Romans 13), they noted there are also many passages that approve resistance to ungodly authority. For instance, when the apostles were commanded by the Sanhedrin to cease preaching that Jesus Christ had risen from the dead, Peter boldly asserted: “We ought to obey God rather than man” (Acts 5:29). There fore it is no coincidence that one of the watchwords of the American revolution was “No King but King Jesus.” For most of the patriots, their faith gave them the courage to stand on God’s word and risk their lives and properties to break the tyranny of an unjust human authority. In their Christian world view, obedience to God took precedence over country or government, and their primary allegiance was to the Lord Jesus Christ. Thus, it was through their obedience and allegiance to God that the Founding fathers, not only wrestled their newly formed republic from the bullying British, but through God’s grace and promise formed a more perfect union. Today “We the People” are blessed with the framework and widow of opportunity to reestablish and build upon the great vision of one nation under God with Liberty and Justice for all. I for one believe we together will make America greater than ever before. 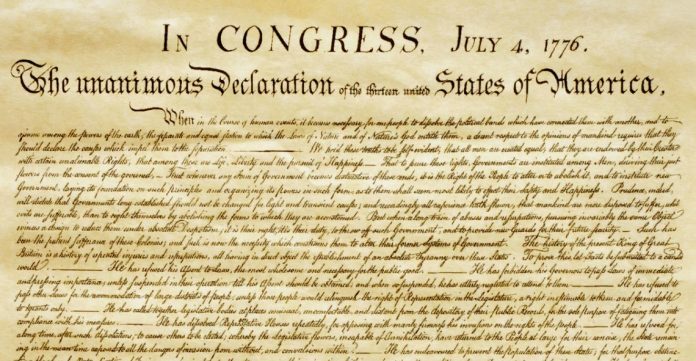 Truly, the American Declaration of Independence is much more than simply freedom from England. God Bless you, God Bless America and May America Bless God. Don’t ever miss The Ron Edwards Experience talk show every Friday at 4:00 PM ET, 3:00 PM CT, 2:00 PM MT, 1:00PM PT emanating from flagship station KCKQ Reno, Nv., SHRmedia and americamatters.us. 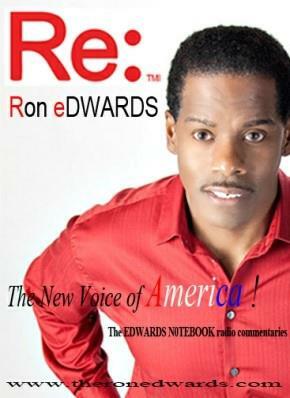 Sunday midnights, it’s The Ron Edwards Experience on TalkAmericaRadio network. The Edwards Notebook continues to Blow Away the Myths and Revealing the Truth on over 90 radio stations across America including 80 on the weekend Captain’s America Third Watch emanating nationwide from flagship station WGUL AM 860 The Answer in Tampa, Fla. The Edwards Notebook is a part of the AM NEWS lineup weekday mornings on KCKQ AM 1180 Reno, Nv. The Edwards Notebook also airs on FM 101.5 and AM 1400 the Patriot in metro Detroit and several other radio outlets across the USA.